Eicher Motors Ltd, the maker of Royal Enfield motorcycles, saw its stock gain 1.5% on Monday after it said over the weekend that it had begun commercial production at a new facility. The plant will take the company’s motorcycle manufacturing capacity to 825,000 units this fiscal year and 900,000 units next year, which provides headroom for earnings growth, given that deliveries of its key motorcycle models—Classic 350 and Bullet 350—continue to lag demand. Conversely, the plant will also raise the growth challenge. A high base slowed Royal Enfield’s volume growth from 68% in FY16 to 31% in FY17. Analysts’ estimates peg volume growth in the current and next fiscal years at 21-32%, which is good considering that two-wheeler sales in India increased less than 10% last year and so far this fiscal year. The worry is not so much about the high base. The benefits of network expansion may come off as Royal Enfield expands beyond tier-I and tier-II cities as these outlets clock lower volumes vis-à-vis the company average, says the brokerage firm. The second and most important issue is product concentration. As IIFL points out, the above-mentioned two models account for more than three-fourths of Royal Enfield sales. The company’s efforts to diversify sales met with limited success with Continental GT and Himalayan models yet to gain traction in the market. As the stupendous run in the share price suggests, these problems have not bothered investors till now. 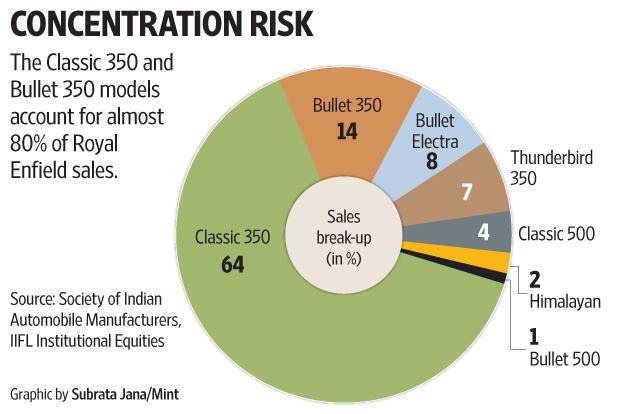 However, with every leading motorcycle maker firming up plans to enter the mid-sized bike segment (engine capacity between 250cc and 750cc) where Royal Enfield is the market leader, this product concentration can undermine Eicher Motors’ growth rate if the order backlog reduces or older models see any demand slowdown. The situation is not worrisome yet—sales are up 25% last quarter. But if the competition gains a foothold in the mid-sized motorcycles segment, it can be a big loss for Royal Enfield. A case in point is Mahindra and Mahindra Ltd in utility vehicles. The best way to hedge this risk is to fast track new product launches, and try to build a diverse product portfolio with successful models. That is easier said than done.